Lincoln Park New Roof | Lincoln Park Roof Tear-Off | Lincoln Park Roof Installation | Lincoln Park New Roof Estimate | Lincoln Park Roofing EstimateMcGlinch & Sons CO.
Are you having trouble with your roof or think you need a new roof? McGlinch & Sons can inspect your roof and provide you with a roofing estimate. We offer roof installation, roof tear-off services, and repairs. McGlinch is a family owned and operated business that has served the Greater Metro Detroit area since 1917 providing new roof estimates and roofing services. We will give you a detailed roofing estimate that is reasonable. McGlinch offers free roofing estimates and lifetime warranties on all our shingles to our customers in Lincoln Park. We provide quality roofing services from experienced roofers you can trust. Lincoln Park, Michigan is a city southwest of Detroit with around 8,000 residents. Lincoln Park is located in Wayne County, an area called Downriver. When Lincoln Park residents are looking for a licensed, insured, certified contractor for their roof installation or roof tear-off project, they call McGlinch. Lincoln Park customers can be assured that a new roof from us will add needed protection to their home while enhancing the beauty. When you need a professional exterior contractor in Lincoln Park, call McGlinch! We will get the job done on time and within your budget. 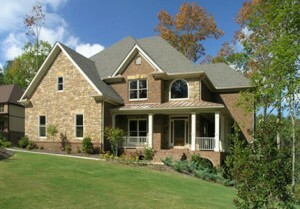 McGlinch has several styles, patterns and color shingle options available to match the unique style of your home. We know about Michigan’s unpredictable weather, so we use the most durable roofing materials on your roof installation. Our materials are long lasting and perfect for Michigan’s freezing winters and hot summers. Our shingles are guaranteed for a lifetime and will add long-lasting value to your home. Contact McGlinch & Sons at (313) 278-2777 for your free roofing estimate today!